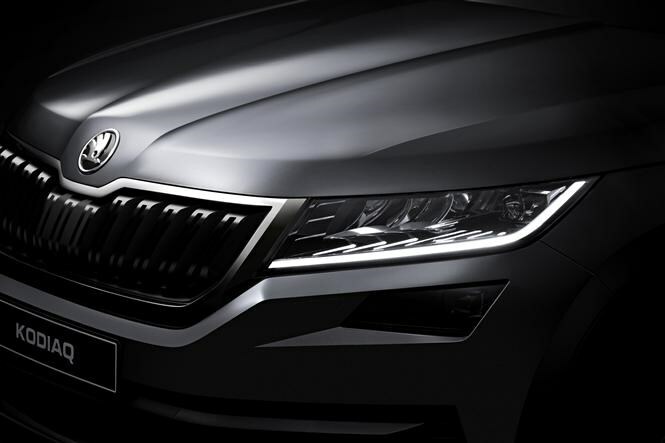 Ahead of its public debut at the Paris Motor Show in September 2016, we were treated to an exclusive preview of Skoda’s new SUV flagship, the seven-seat Kodiaq. 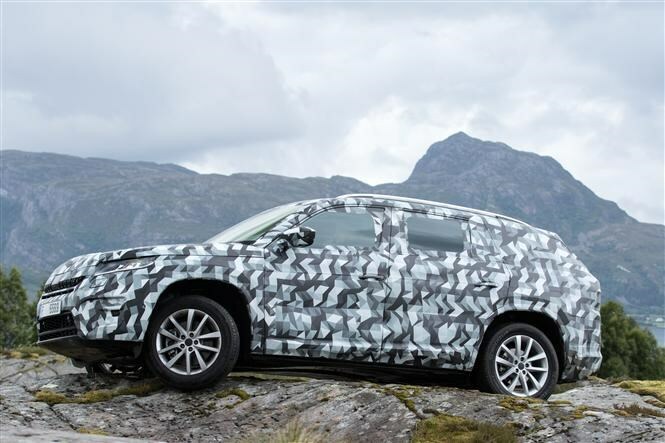 Named after an Alaskan bear, the Kodiaq will be available as a five- or seven-seater, although it’s yet to be confirmed if we’ll get the five-seat option here in the UK. It’s the first SUV in the Skoda range to adopt the latest design language, but from what we’ve seen it’ll retain much of the design shown on the Vision S concept when it arrives to take on the likes of the Land Rover Discovery Sport and Hyundai Santa Fe. 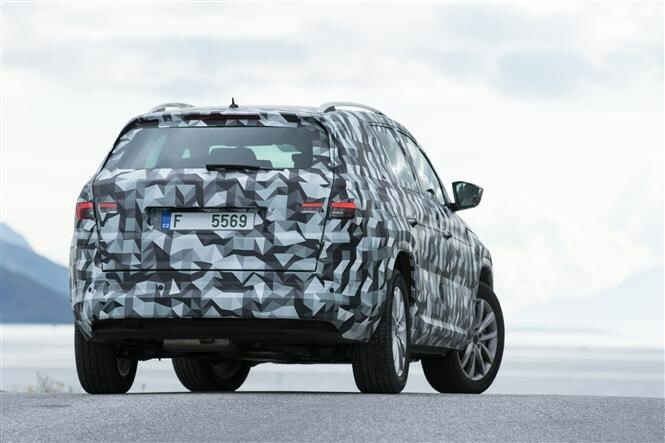 The Kodiaq will feature a range of turbocharged petrol and diesel engines found elsewhere in the VW Group. For petrol fans, there will be two 1.4-litre TSI units with 125hp and 150hp; the latter which will feature cylinder-shutdown technology to boost economy. The lesser-powered 1.4 comes in just front-wheel drive, six-speed manual form, while the 150hp 1.4 TSI comes with a choice of front- or four-wheel drive and manual or DSG automatic gearboxes. The most powerful petrol will be a new 2.0-litre TSI with 180hp, available exclusively with four-wheel drive and a seven-speed DSG automatic gearbox in top-spec trim. On the diesel front, there will be a 2.0-litre TDI available in two power outputs – 150hp and 190hp. The former will be available in front- or four-wheel drive form with a choice of six-speed manual or seven-speed DSG gearboxes, while the latter is limited to four-wheel drive and a DSG gearbox. The Kodiaq is only slightly longer than the Octavia, but shorter than the larger Superb. There will be five- and seven-seat versions to choose from, although it’s yet to be confirmed if we’ll get the five-seater in the UK. In seven-seat form, the Kodiaq has a 270-litre boot – around 20 litres more than the Citigo, but this increases to 630 litres with the rearmost seats folded into the boot floor. Outright cargo space is 2,005 litres with all seats folded. 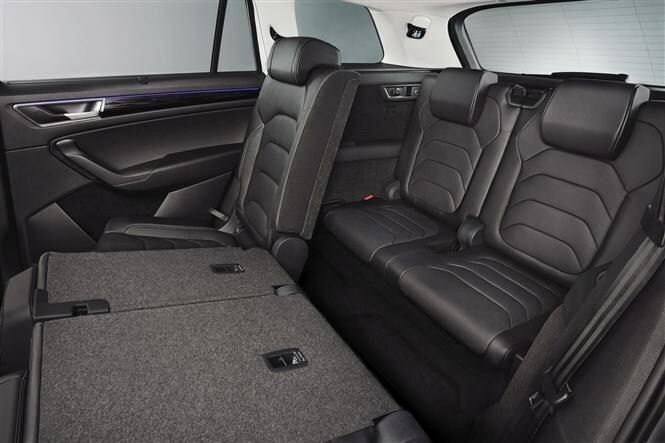 The five-seater offers more capacity due to the space gained from a lack of sixth and seventh seats. There’s an adjustable boot floor for sectioning off parts of the load area, while the boot is 720 litres in the regular set-up. 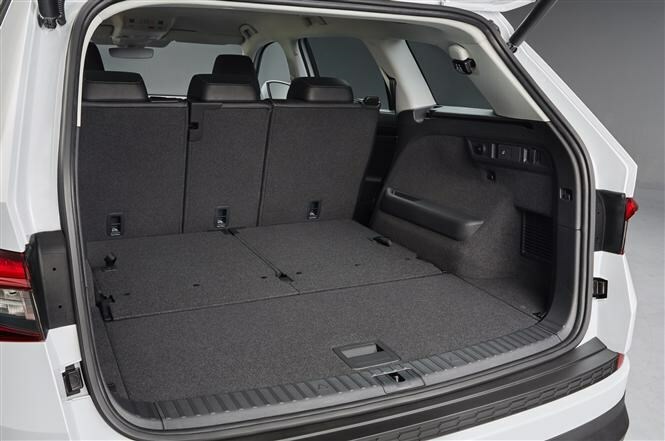 With all seats folded, total boot capacity jumps to 2,065 litres and there’s a handy place to stow the removable boot cover, too. There’s plenty of room in the front two rows of seats with a generous amount of headroom, while the two rearmost seats are best suited to smaller passengers, although there’s a surprising amount of headroom and it's big enough for short journeys if the 60:40-split middle row is slid forward. There will be an option for a 40:20:40 split as well to boost versatility. 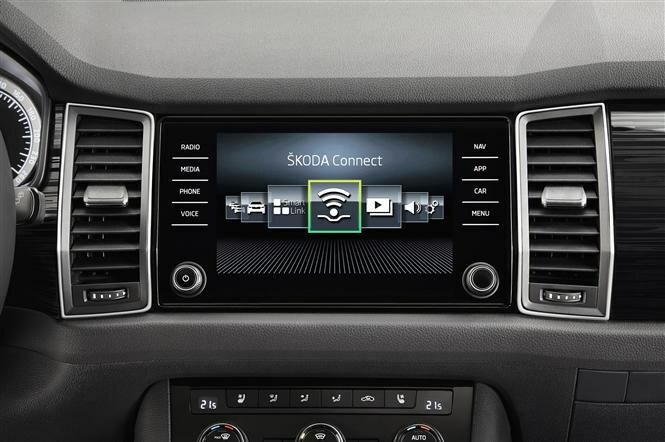 The Kodiaq comes with some handy features, which Skoda calls ‘Simply Clever’. These include door protectors that deploy when you open a door to protect from being damaged or damaging other cars, a hands-free tailgate, an optional Sleep package with adjustable rear headrests and an in-car communications system. The latter uses microphones in the front of the car to help rear passengers hear what’s being said up front by relaying what’s been said through the speakers in the rear. It should stop the need to shout to/at those in the back on long journeys! When it goes on sale, the Kodiaq will have a total of 22 driver assistance systems available, either as standard or from the options list. 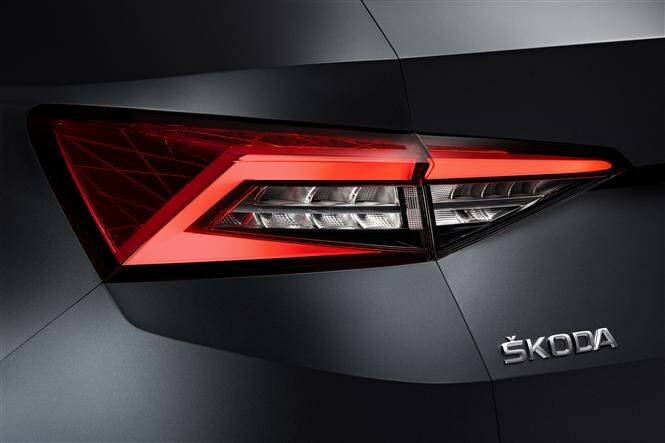 Highlights include Area View with cameras around the car to help with manoeuvrability, a trailer parking assist system which will steer the car and trailer/caravan into a space and a set of full LED headlights, front and rear, that can be specced with high beam assist as well. As with other Skoda models, the Kodiaq will come with a choice of familiar driving modes – Normal, Sport and Comfort. There’s also a new Snow mode for more wintry conditions, while a dedicated Off-Road button sets the car up for use in the rough stuff. It’s a pre-set system that adjusts the car’s throttle response and traction control for use in trickier conditions, but don’t let that fool you into thinking the Kodiaq will be a serious mud-plugger like a Land Rover Discovery Sport. 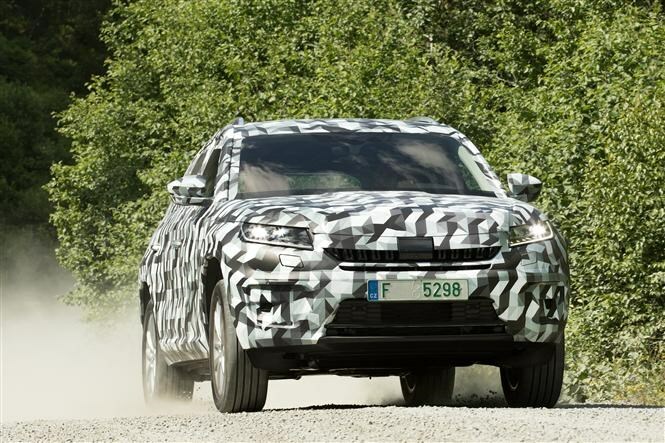 Skoda insists the Kodiaq is more SUV than 4x4. Back on the inside, an updated infotainment system will debut in the Kodiaq. Everything will be familiar to existing VW Group customers, but the display now features touch-sensitive ‘buttons’ flush with the screen as opposed to physical ones, while the software has been updated with much quicker transitions between functions. It'll also come with useful features such as wireless phone charging. We gave it a go and the system reacted quickly to our inputs, never getting flustered and never freezing, although the touch-sensitive virtual 'buttons' could be slightly less user-friendly to use on the move than physical buttons, despite the more upmarket appearance. We’ll reserve judgment until we get more time with the car on the road, though. 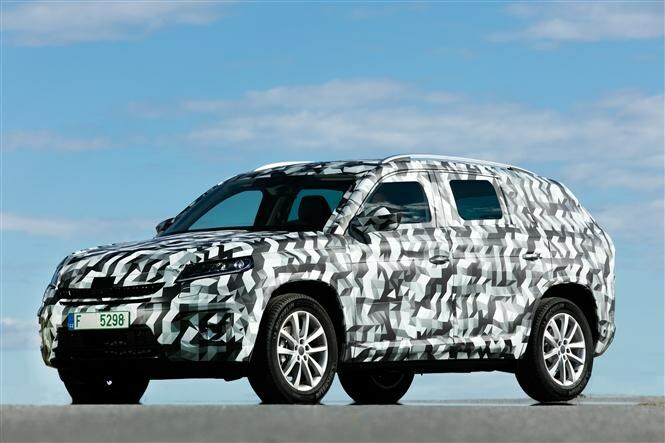 The new SUV will be the most connected Skoda ever, too. Online services will be available, as will various apps, including a new Skoda CONNECT app which lets you check the status of the car when you’re away from it, honk the horn and even locate it if you’ve forgotten where you parked. You’ll be able to send sat-nav routes and directions to the car ready for when you get in it, too. The system will also come with more care-focused features, including an automatic emergency call function that alerts the emergency services in the event of an accident with information about where the car is and how many passengers there are, while there’s the option to contact the emergency services directly if you’re able to do it yourself. The car will also be able to send data to dealers directly, so they can contact the driver to offer a service such as tyre replacements if you get a puncture or if a service is due. Full details of UK-specific prices and specifications are yet to be announced, but it’s expected to follow the Superb in terms of trim levels, starting with S and moving up through SE to SE L.
There’s been a lot of demand for top-spec Laurin & Klement Superbs too, so we wouldn’t be surprised if a flagship version joins the range later on, while a Sportline version isn’t off the cards either. Price-wise, the Kodiaq will cost slightly more than the Superb, expected to cost from around £22,000 and rising to around £35k for top-spec models. 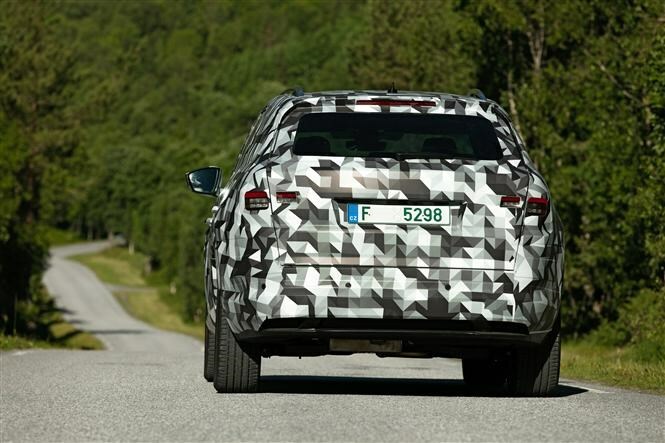 First deliveries of the Kodiaq will be in spring 2017 following its debut at the Paris Motor Show in September. 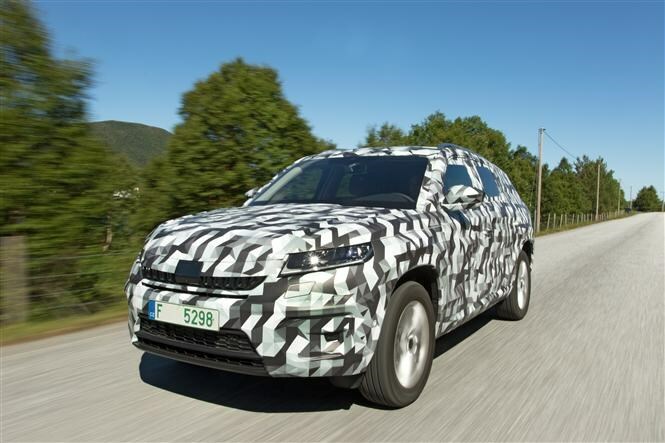 You can read our current preview of the Skoda Kodiaq here.